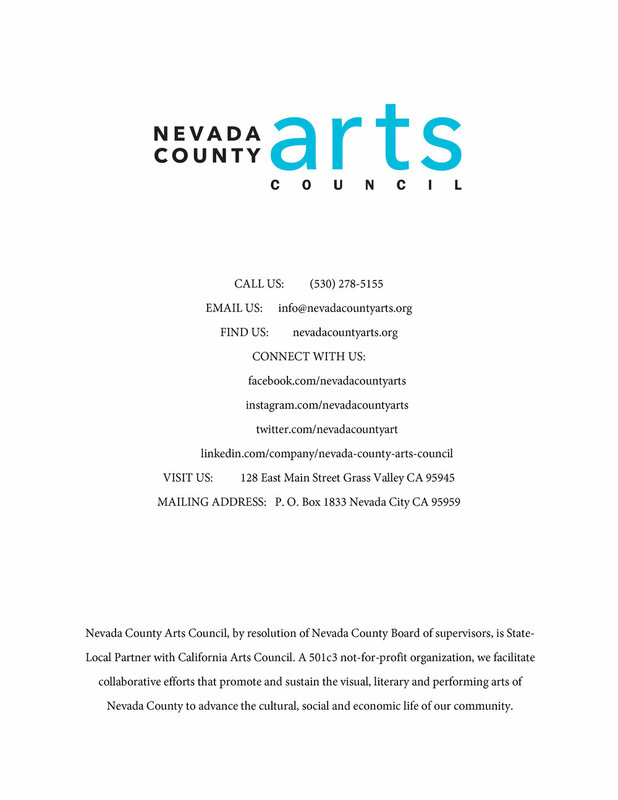 During 2018 and 2019 Nevada County Arts Council undertook the first comprehensive survey of entities engaged in cultural programming accross the whole of Nevada County. 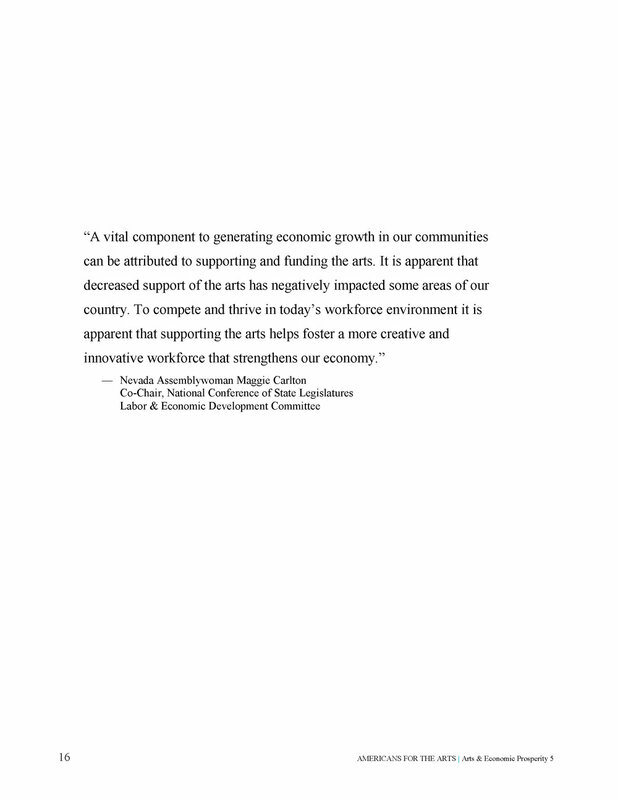 In the year it took to survey the creative industries in Nevada County we relied upon many for their vision, good will and patience. 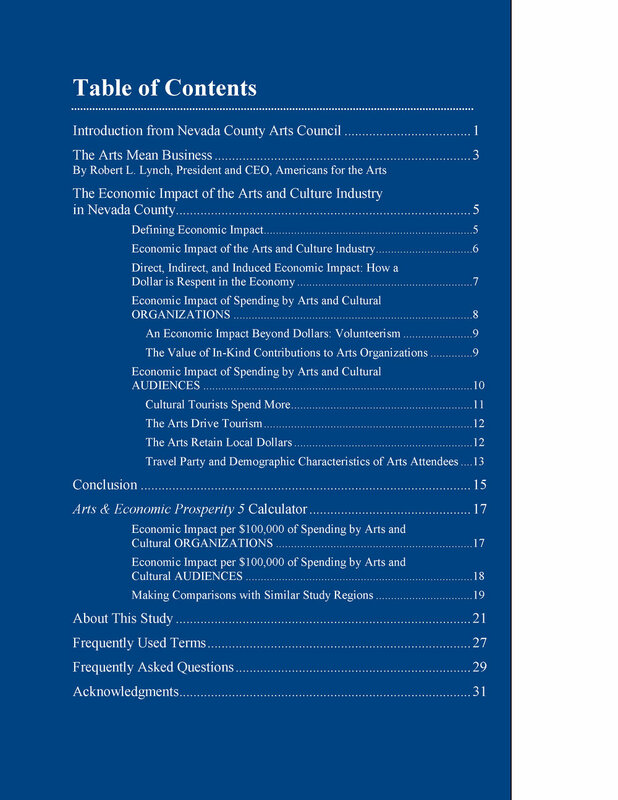 We thank our arts leaders from east to west—from those within larger organizations serving diverse audiences, to those who run much needed programs serving important niche segments of our population, and those running small artisan or creative businesses that serve our population and attract both tourists and new residents. 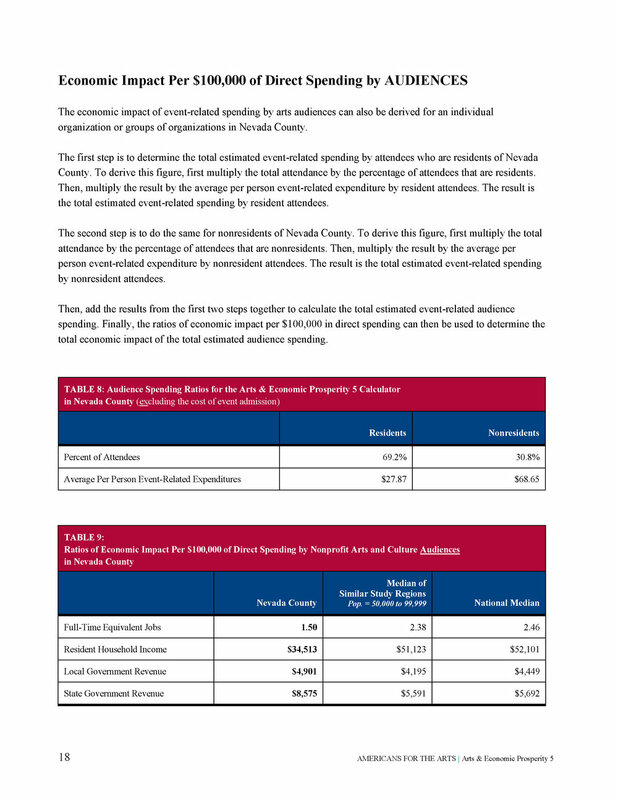 The full report can be read online here by clicking through the pages with the direction arrow on the right. 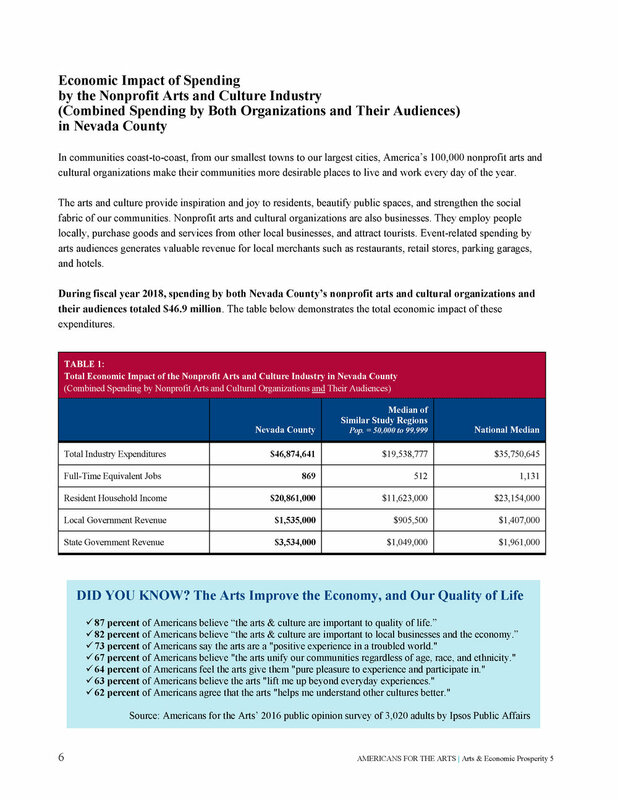 To download the PDF file click here. 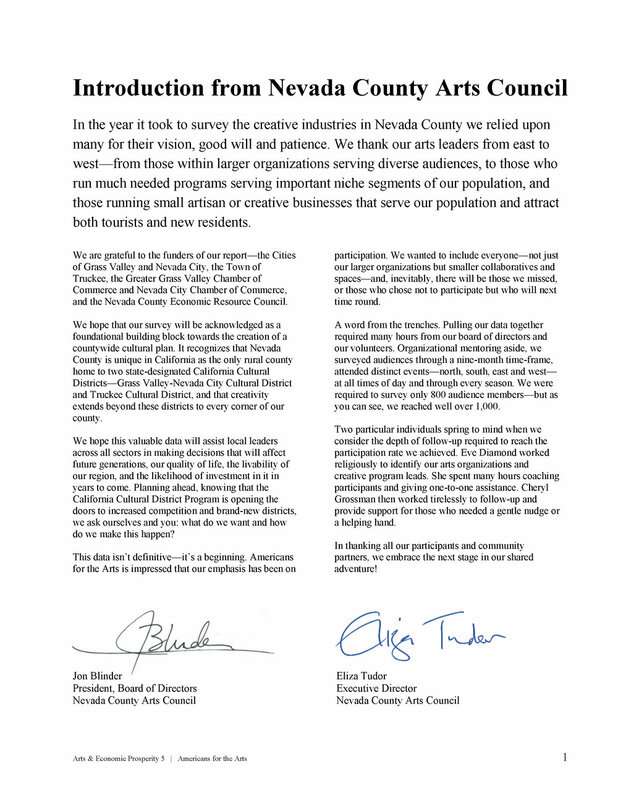 We hope that our survey will be acknowledged as a foundational building block towards the creation of a countywide cultural plan. 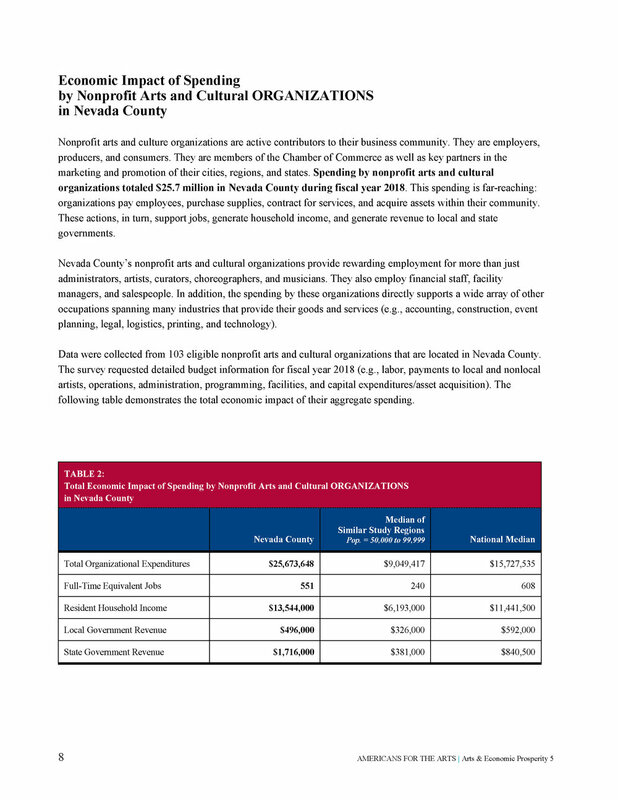 It recognizes that Nevada County is unique in California as the only rural county home to two state-designated California Cultural Districts—Grass Valley-Nevada City Cultural District and Truckee Cultural District, and that creativity extends beyond these districts to every corner of our county. 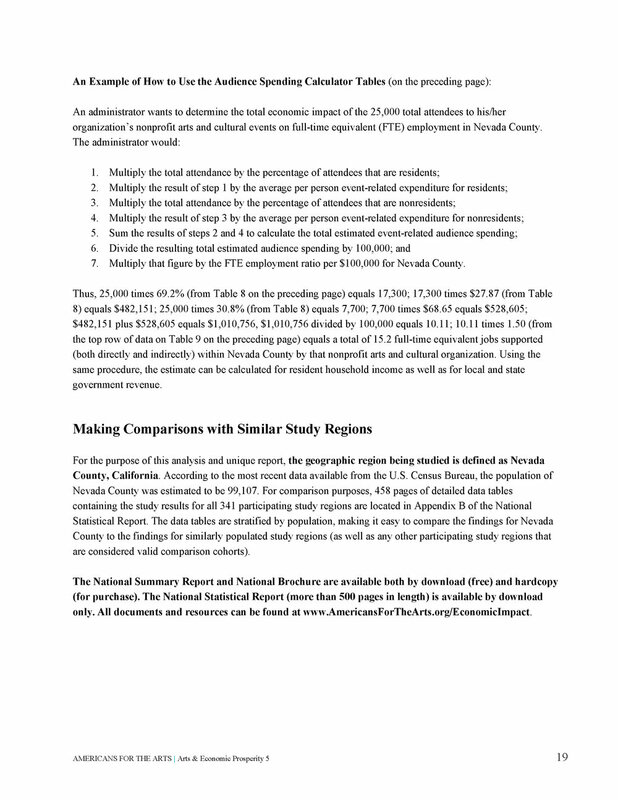 We hope this valuable data will assist local leaders across all sectors in making decisions that will affect future generations, our quality of life, the livability of our region, and the likelihood of investment in it in years to come. 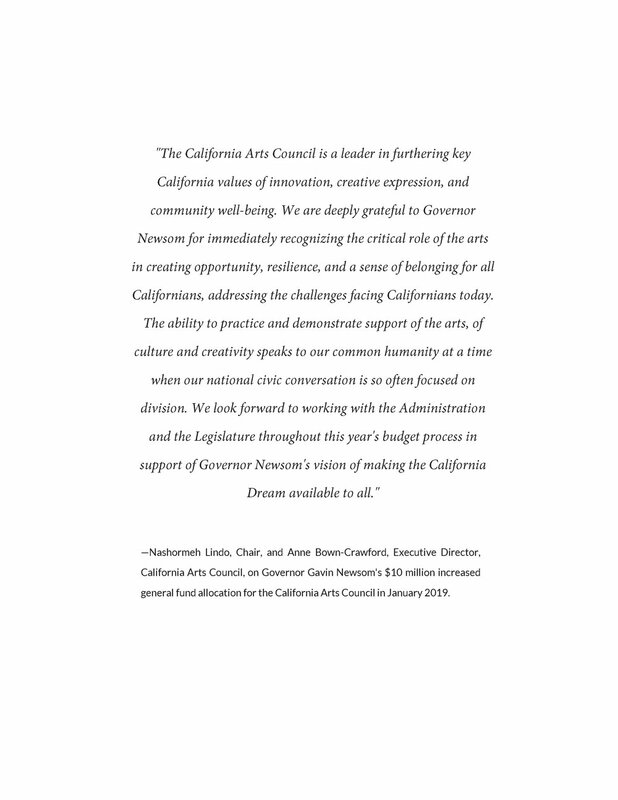 Planning ahead, knowing that the California Cultural District Program is opening the doors to increased competition and brand-new districts, we ask ourselves and you: what do we want and how do we make this happen? This data isn’t definitive—it’s a beginning. 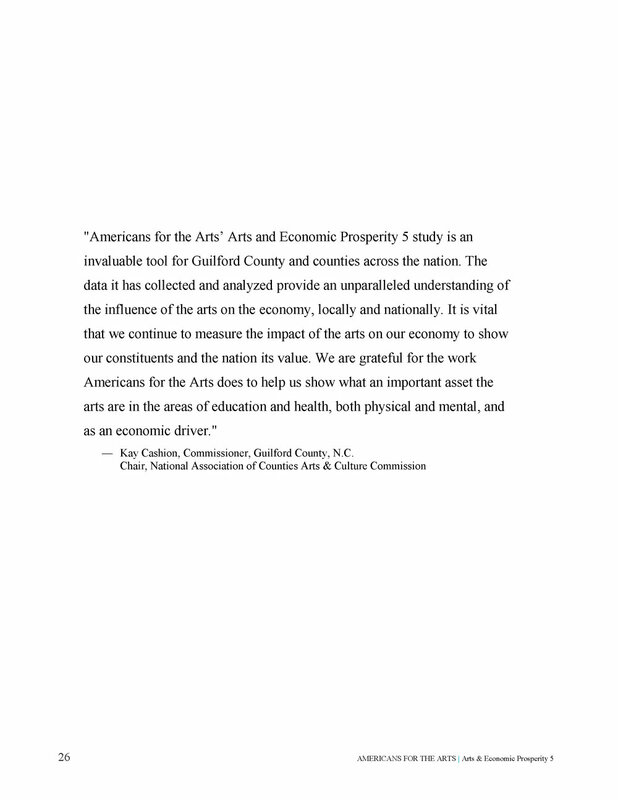 Americans for the Arts is impressed that our emphasis has been on participation. We wanted to include everyone—not just our larger organizations but smaller collaboratives and spaces—and, inevitably, there will be those we missed, or those who chose not to participate but who will next time round. A word from the trenches. Pulling our data together required many hours from our board of directors and our volunteers. 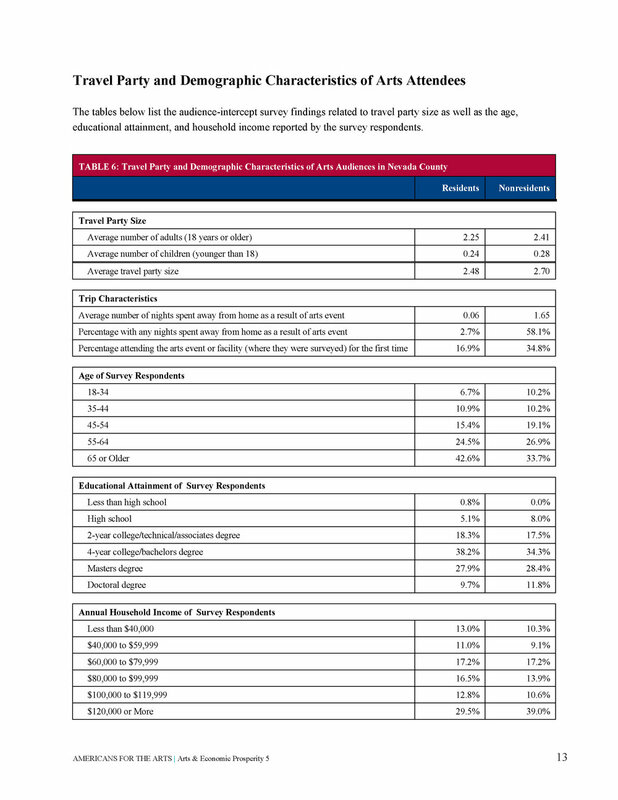 Organizational mentoring aside, we surveyed audiences through a nine-month time-frame, attended distinct events—north, south, east and west—at all times of day and through every season. We were required to survey only 800 audience members—but as you can see, we reached well over 1,000. Two particular individuals spring to mind when we consider the depth of follow-up required to reach the participation rate we achieved. 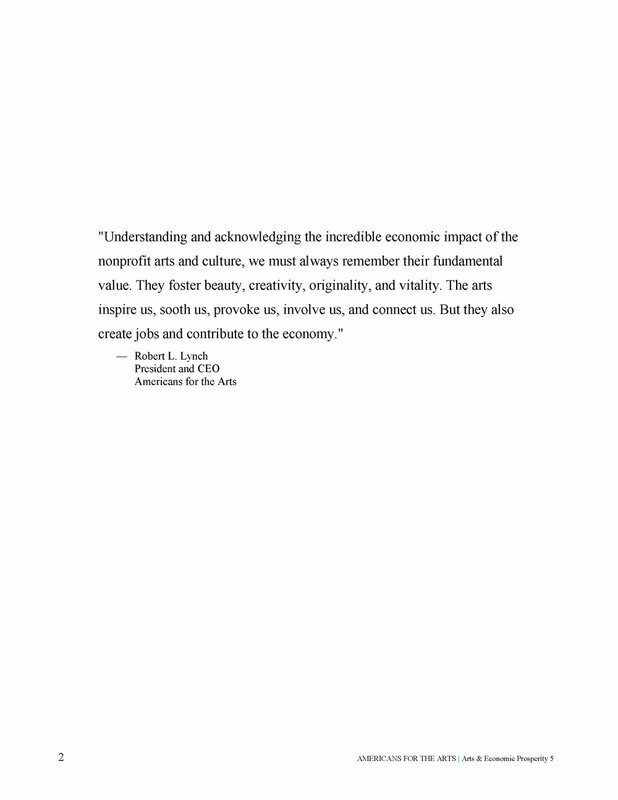 Eve Diamond worked religiously to identify our arts organizations and creative program leads. She spent many hours coaching participants and giving one-to-one assistance. Cheryl Grossman then worked tirelessly to follow-up and provide support for those who needed a gentle nudge or a helping hand. In thanking all our participants and community partners, we embrace the next stage in our shared adventure!